The rumors and speculation surrounding All Elite Wrestling (AEW) seem to get bigger and bolder by the day, but we've not really heard much about their future plans for events, until now. WrestleTalk.com has reportedly spoken to a source very close to AEW who has revealed the promotions believed schedule of events before launching on television. WWE Hall of Famer Jim Ross has confirmed that he’s in talks with AEW. He made the news known when he appeared this afternoon on ESPN’s Outside the Lines discussing his departure from the WWE at the end of this month. Ross stated “They are working on it” and that he’d love to have a radio gig talking college football and would like to do some voiceover work. The inaugural show promoted by AEW, Double or Nothing, will take place at the MGM Grand Garden Arena in Las Vegas on May 25, 2019. It was announced on the latest episode of All Elite Wrestling's "Road to Double Or Nothing" show that a grudge match between Kenny Omega and Chris Jericho will main event AEW's first event which takes place on Saturday, May 25 from the MGM Grand Garden Arena in Las Vegas, Nevada. Following the news that Jim Ross has signed with All Elite Wrestling (AEW) the company has announced former WWE ring announcer Justin Roberts has been added to their broadcast team on the latest edition of their “Road to Double or Nothing” show. The company also confirmed that Alicia Atout will be joining the team as a ring announcer and backstage correspondent. Both Atout and Roberts worked the All In show last year. 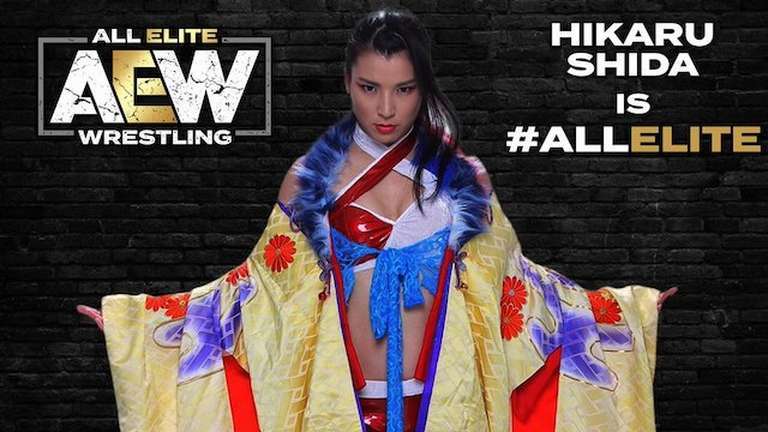 Japanese wrestler Hikaru Shida has signed with All Elite Wrestling. She has a background in the Oz Academy and Pro Wrestling Wave promotions in Japan. AEW is set to make its promotional debut on May 25 with Double or Nothing. The event will be held at the MGM Grand Garden Arena in Las Vegas, Nevada. All Elite Wrestling’s new television home is rumored to be on TNT/TBS (Turner Sports). The official announcement is expected to take place at the network’s upfront presentation on May 15th. For those unaware, Turner Sports operates TBS and TNT (and other networks like TruTV). They are also under the Warner Media umbrella, which also includes HBO. The network also produced WCW back in the day. DAVE REPORT: Vince blev tillfrågad av AEW i december om han ville sammanfoga förbunden. Han tackade nej. Nej Sebbe, det var väl ändå AAF och XFL. Ta lite påskmust i värmen nu.